The Sumvision Kata gaming mouse was kindly sent to me for review. The body of the Sumvision Kata mouse is black, but running down either side are a colored strip that lights up. As well as the usual left/right and middle buttons there are two additional buttons on the left-hand side of the mouse (used for things like forward/backward when browsing the internet) and a button on top for changing the DPI. Interestingly the middle scroll wheel button was flat rather than the traditional rounded approach and although it felt unusual at first it’s a wonder more mice don’t feature such a design. Initially, it felt too light for my liking, but this can be adjusted by replacing the onboard weights. There are three to choose from, 0.2, 0.4 ounces or 0.6 ounces allowing you to find your own personal preference. As well as adjusting the mouse weight you can also adjust the DPI, very handy if you want to up the response time in FPS games and then slow it down when on the desktop. As mentioned this is done via a button on the top of the mouse and when the DPI is changed the light color at the back bottom of the mouse also changes. This is handy in the dark if you want to ensure you have the DPI setting selected as you want it, and the two light strips make it easy to locate should you take your hand away. The mouse works right out of the box without any need to download software. Additional software is available and that allows you to customize the mouse settings further with profiles, allowing you to reassign mouse button functions, for example, you might want one of the buttons to double click when you press it. 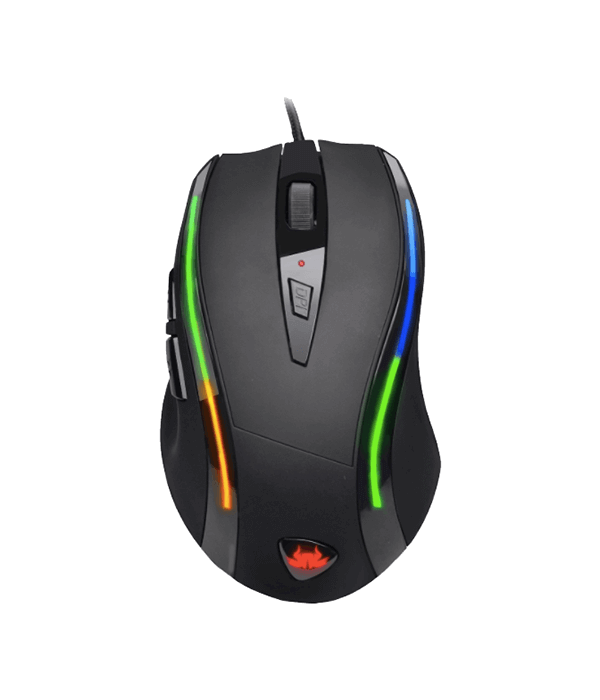 This is a well-built mouse that gives you lots of customization options for the same price as a bog standard no frills mouse. The mouse itself when lit up it gives the look as though it’s made from glass it has a nice weight to it and weighs 5.6 ounces and does not feel cheap or flimsy at all, another great feature about this mouse is that it can be used by both left and right handed people when clicking left or right the buttons are very firm and easy to press when using the scroll wheel on the mouse it clicks and doesn’t glide, to be honest, I prefer them when they glide to change the dpi settings in the button is nice and firm to click, it will flash 4 times to indicate it’s changed. The mouse has a good length to the cable at 5.9 inches and is much thicker than the standard as its made from a nylon material underneath is where the on/off and lock button is for the lights. Another great thing that is you can download the software from their website which you will need WinZip or WinRAR to do so this gives you options to change the scrolling speed, the mouse speed, the double click speed also you can set your buttons in a different layout, also your dpi settings, another good thing the software is fully English unlike some I have downloaded for another mouse in the past, the dpi settings go up to 4000 the fact it’s an optical mouse it can be used on almost any surface the mouse comes complete with cleaning cloth and instructions. 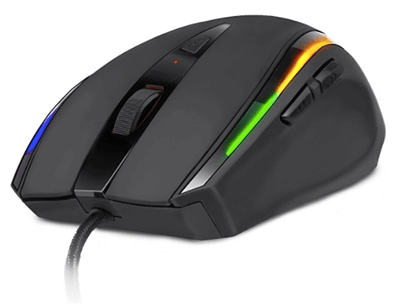 The Sumvision Kata gaming mouse is a low cost way to add a little light to your PC setup. 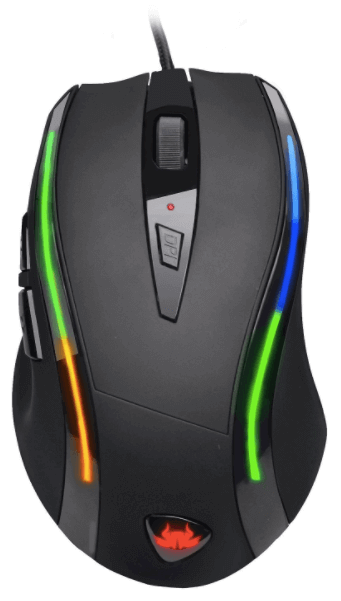 The body of the Sumvision Kata mouse is black, but running down either side are a colored strip that lights up. As well as the usual left/right and middle mouse buttons there are two additional buttons on the left hand side of the mouse (used for things like forward/backward when browsing the internet) and a button on top for changing the DPI. Interestingly the middle scroll wheel button was flat rather than the traditional rounded approach and although it felt unusual at first it’s a wonder more mice don’t feature such a design. Initially the Sumvision Kata felt too light, but this can be adjusted by replacing the onboard weights. There are three to choose from, 6g 12g or 18g allowing you to find your own personal preference. As well as adjusting the mouse weight you can also adjust the DPI, very handy if you want to up the response time in FPS games and then slow it down when on the desktop. As mentioned this is done via a button on the top of the mouse and when the DPI is changed the light color at the back bottom of the mouse also changes. This is handy in the dark if you want to ensure you’ve the DPI setting selected you want, and the two light strips make it easy to locate should you take your hand away. The mouse works right out of the box without any need to download software. Additional software is available and that allows you to customize the mouse settings further with profiles, allowing you to reassign mouse button functions, for example you might want one of the buttons to double click when you press it. The Sumvision Kata feels well-built and gives you lots of customization options for the same price as a bog standard no frills mouse. The only one for me is the scrolling wheel, I prefer them when they fully glide and no clicking apart from the little issue I have no problem recommending it.